So if you stay in India, you will hardly get any good Agenda. You would be craving for an Agenda like a Lilly Pulitzer one, but you will end up having a typically formal black colored Agenda. In that case, I would suggest you to keep calm. I have a way to make it good (like always)! This was my father's Agenda when I was a kid. He had hardly written anything inside, but as always, I snatched it from him (I usually do that. Half of his office stuff is used by me). And as a kid, maybe it was back then, in 5th grade, maybe, I wanted to make it look gorgeous. I hated black then, as Metal and Rock were not introduced to me, yet. I had cut the big and bold alphabets from a kid's magazine (something of Disney, I suppose), and had kept it in a dad's envelope. So, I don't know how I remembered it, but I did, and I started pasting it on the cover of this black unsightly Agenda. I made my name and made 'Diary', too (I was obsessed of having a personal diary). 'The Cutie'? Alright, don't laugh. I had an account at Barbie.com. 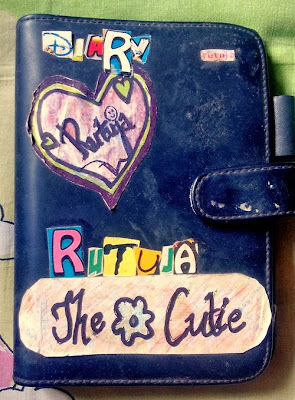 I had to make a Diary over there, and they gave my diary the name 'The Cutie', and hence this name. I simply wrote it on a chart paper and stuck it on the Agenda. And, I have no idea about the heart with my name on it. Thus, I converted an ugly black Agenda to something that I loved, back then. What are your views? Do you keep a Planner/Agenda/Organizer? P.S. Tips on how to maintain a Planner/Agenda/Organizer coming soon.